I wasn’t sure how to start this post – well – I started it with a tiny squeal and a happy dance, because it’s my favorite part. So I guess you can just picture that, and we’ll move on. I. Love. Fabric. I’m a very neutral decorator, so our home only has plants and quilts to add color and life to the place…the quilts being my favorite! Look at it this way – quilts don’t die if you overwater them. Which is apparently a thing. But before we dive down the fabric rabbit hole – let’s catch up. Let’s start with the difference in “quilting cotton” vs. “other cotton”. Cotton fabric is everywhere – apparel, bedding, home decor – and at all different prices. So why do I recommend quilting cotton, especially when it costs anywhere from $6-10/yard?! Disclaimer: I am not a textile expert. But I’ll do my best. Quilting cotton is made specifically for quilting…yes, duh, but this is important. Meaning it cuts well, is typically thicker than apparel cotton – making it easy to work with – yet with enough softness and drape to make a nice blanket. It will withstand lots of handling during sewing without unraveling and will wash without fading or bleeding. Using the right tool makes the job easier, and while lots of folks have sewn quilts with all sorts of materials, high-quality quilting cotton is a beginner’s best friend. And the honest answer is – I don’t know. I have read and heard that chain-store fabric is of lesser quality than the premium cotton sold in quilt stores. It (may) bleed and shrink in the wash, have a coarser “hand” (the softness, drape, and overall feel of the fabric), and (may) not hold up well to years and years of use. I say *may* because I haven’t used it before, and can’t refute or validate any of these claims. This quilt will use approximately $80-100 of fabric at $6-10/yard. If chain-store fabric is what you can afford, or if you have experience with it and it’s worked great for you – buy it! I would much rather you enjoy this experience and not back out simply because the fabric I use is too expensive. You can also mix premium designer prints with inexpensive background and backings to bring the designer fabric cost down to ~$30. Fair enough? Fabric quality can be a sticky subject. So you do you! Let’s move on and dive into the world of designer fabric, precuts, and my favorite stores! Remember kingdom-phylum-class-order-family-genus-species? …..no? It’s ok, I had to google it to get it right. But the idea is the same in the fabric world. It goes like this: manufacturer – designer – collection. This was really confusing to me when I first started, so I’ll assume you’re as lost as I was. In this photo, the cotton manufacturer is Art Gallery Fabrics. Maureen Crackness is the fabric designer. The name of the collection is “Sunkissed” – a bundle of summer-inspired fabrics designed to coordinate with one another! This is actually super awesome for beginner and experienced quilters alike – if you’re like me and have trouble matching your socks, you can let the artists do all the work! Using all or part of a collection is an easy way to get a cohesive look and coordinate prints. Collections are only available for a limited time before they stop production, so I tend to stock up on my favorites. Remember when I said rotary cutters were the best thing since sliced bread? Well, pre-cut fabric (simply called “precuts”) is the sliced bread. Trust me on this one. Let me explain. A bolt of quilting cotton is 40-42″ wide. This measurement is abbreviated as “WOF”, or width of fabric from selvage to selvage (edge to edge). We then cut fabric off the bolt by the yard – so a yard of fabric measure 36″ x WOF. Quilts typically only require 2-3 yards of fabric – so to get more pattern variety, many quilters don’t buy by the yard. You can get half yard cuts (18″ x WOF) or quarter yard cuts (9″ x WOF). Problem is, while quarter yard cuts are ideal, it’s just a long skinny piece of fabric that isn’t terribly useful. And then someone thought of fat quarters. Bless them. And their children, and their children’s children. Because the idea was that good. A fat quarter is still a quarter yard, but it measures 18″ x 21″ rather than 9″ x 42″. It’s a more versatile cut for dicing up into all sorts of shapes and sizes. If you have a pattern that uses precuts, you can cut down on the amount of fabric you need to buy. It’s also nice when you don’t have a plan for a collection you like! Just stash a jelly roll or a layer cake and save it for a rainy day. Our quilt is designed to use either 11 fat quarters, or 3 charm packs. Best part – if you choose charm packs, you don’t have to sub-cut the print! It can save some time in addition to reducing fabric waste, so precuts are handy. So you’re going to need fat quarters or charm packs, and some yardage for binding, background, and backing. Now what. I am not lucky enough to have a modern quilt shop within reasonable driving distance, so I do all my fabric shopping online. If you’re ready to just stay in your pajamas all weekend, check out my favorite shops! Fat Quarter Shop – won’t have the best prices in town, but they have a huge selection of yardage and precuts, and you may save money on shipping by getting everything you need here. Excellent place to browse if nothing else! Half-yard minimum on yardage cuts. Southern Fabric – sells a lot of fat quarter bundles and precuts. Half-yard minimum on yardage cuts. Hawthorne Threads – manufactures their own fabric as well as carries other quilting cotton. 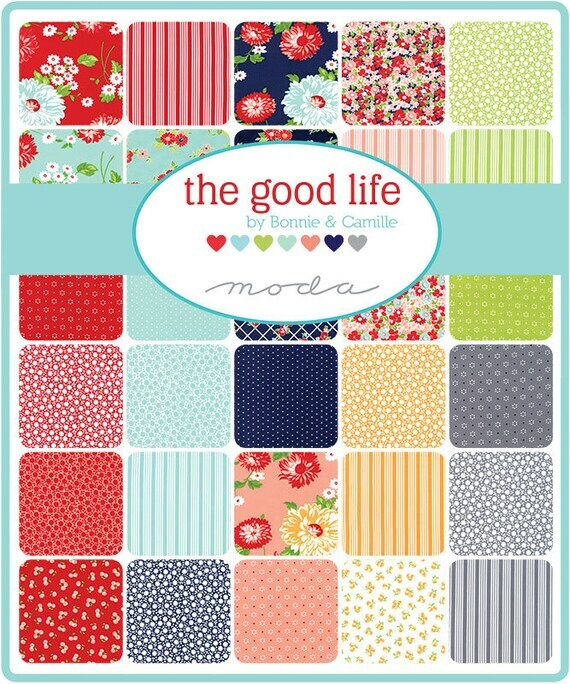 Great for fat quarter bundles and often offers 1/2 collections, but doesn’t have a ton of other precuts. Half-yard minimum on yardage cuts. Catching Stitches – great store for precuts, and offers 5-yard backing cuts at a steep discount! Bobbie Lou Fabric – priced a bit steep for fat quarters, but has a huge selection. Carries a lot of Art Gallery Fabrics. Stash Modern Fabrics – carries a ton of collections and curated bundles of modern fabric. Fresh Modern Fabric – also carries a lot of Art Gallery Fabrics. Browse Cotton and Steele collections here. Some of my fabric pulls for this quilt are below – I’m having trouble deciding! Once you pick your fabric, I’d love to see your choices shared with me on Facebook or Instagram! (@rebaleighhandmade) Use the hashtag #rebaleighLearntoQuilt to see what others are making! *A note on backing – this is assuming you’ll be using cotton backing that is 40-42″ wide. If you plan to quilt at home, I HIGHLY recommend cotton. It’s the easiest for new quilters to work with. If you plan to send your quilt to a long-arm service, you can consider using flannel, minky, or other fabric substrates on the back and will need to double-check measurements before ordering. Contact your quilter ahead of time to make sure they are able and comfortable with what you’re considering. I exclusively use cotton at home because that’s what I’m comfortable with, and I like to have my long-arm quilter put minky on the back! I’ll use a white background for both options, and I haven’t decided on backing fabric yet. I’ll be quilting it at home, so I’ll use a bold cotton print on the back for interest. Best part – the tutorials will be around for.ev.er. So if you can’t join the quilt-along this spring, these tutorials will live right here for you to visit later. A never ending virtual sew-along! Now – let’s talk about what you need to get started. There is an overwhelming amount of tools and supplies (called notions) at every price point you can imagine. In two posts, we will go through what you need to make this quilt, where to get it, and if you’re on a shoestring budget – what you should prioritize. A $10 spool of thread will make a nicer quilt than a $30 cutting mat. Most of my notions come from Walmart or Amazon, but don’t forget to browse your local quilt shop if you’re lucky enough to have one! Part 1 of this week will cover sewing machines and thread. Part 2 will cover cutting and pressing supplies. Not the most exciting, but my goal is to give you enough time to shop around for your supplies before diving into fabric selection. (The best part!) A full schedule is located at the end of the post. This is the thing I get asked about the most, by far. I’m going to assume most of you don’t have one and have already googled “best sewing machine for beginners” and want to gouge your eyes out in frustration. Oh, believe me. I’ve been there. I’ve owned four sewing machines, and have pieced quilts on three of them. There is an overwhelming amount of options and a huge price spread on machines, and you’ll find everything from basic mechanical machines to crazy fancy computerized gadgets with 100,388,232,398 types of stitches that embroider and free motion quilt and do your laundry for you. One thing to remember – to make a quilt, you only need to sew a straight line. That’s all. Nothing fancy required. In general – you get what you pay for and the cheapest machines will not perform as well as a pricier machine, regardless of the feature list. Here’s how I found my dream machine, and what I recommend to others: borrow if you can, or buy an inexpensive machine, until you know a) that you’re going to keep sewing and b) what you want in a machine. There’s no good substitute for personal experience, and you’ll find 20 different quilters that happily sew on 20 different machines. Singer Promise II ($100 at Walmart) – I can’t in good conscience recommend this machine. I sewed my first three quilts with it, but I threatened to toss it out the window more than once. It skipped, bumped, clattered, and broke my thread every six inches, but we managed. I promptly upgraded once I was hooked. Janome New Home 2030 DC (found for $200 on Craigslist, retails for ~$500) – Sewed well with only a few minor hiccups. I still use this machine for non-straight stitch projects and recommend it with a few notable drawbacks. Contact me if you’re interested in a full review of this machine and I’m happy to help you out! Juki TL-2000 ($650 on Amazon) – A straight-stitch-only machine designed for specifically for quilters. Wicked fast and extremely reliable – she’s my workhorse and one true love. I don’t recommend this for your first sewing machine, but happy to provide a full review of this machine upon request as well. If you’re just dipping your toes in, see if you can borrow a machine. Check Craigslist or similar places for used machines. Lots of people buy a high-end sewing machine only to find they don’t care for sewing. Take advantage of a steal if you can find it! Get the best you can afford within reason, but if all you can afford is a $40 machine from Walmart, it will sew. You may threaten it with hellfire and fury, but it will sew. Don’t be afraid to go in a sewing/quilting store and ask for recommendations! Let me know if you have specific questions – I can’t possibly know everything about every machine, but I will try to help out as much as I can! The cast of characters in my sewing room – Jukester and Ms. Janome. Okay, once you’ve secured a machine to use for a couple of months you’ll need a few miscellaneous “sewing” supplies to go with it. Most importantly – a 1/4″ quilting foot. Also called a 1/4″ piecing foot. Or simply a 1/4″ presser foot. It measures just shy of 1/4″ from the needle to the edge of the foot – quilting patterns use a 1/4″ seam, so this is a must-have to sew accurate blocks! You can buy one with a guide or without – personally I found the guide to be a nuisance. Presser feet are machine specific and a 1/4″ foot rarely comes supplied with a new machine. Your best bet? Google “<your machine make/model> 1/4 inch presser foot” or go into a quilting store and ask for help finding one that fits your machine. I found my 1/4″ Juki foot at www.sewingpartsonline.com and the Janome and Singer feet on Amazon. Bobbins – these should come with your machine, but double check you have them. If you don’t, pick up a pack of either plastic or metal. As long as they fit your bobbin case, you’re good to go. Sewing machine needle – “universal” or “quilting” needles, size 80/12 or 75/11. (The two numbers are simply different sizing models – like US vs. European shoes.) I use Schmetz quilting needles size 75/11, available at Walmart or Amazon. Talk to those same 20 quilters, and chances are you’ll find varying opinions on thread choices. I exclusively use Aurifil 50 wt. cotton thread to thread my machines. Why? Because that’s what my mentor uses and recommended, and it’s always worked beautifully for me. I prefer to use cotton thread with cotton fabric – you’ll find folks adamant that using polyester thread will eventually wear holes in your cotton fabric due to differences in fiber strength. I haven’t had a quilt long enough to tell – but just in case, I use cotton. Aurifil 50 wt. cotton thread (I use white – color 2024). 1422 yards is more than enough to make an entire quilt. Not available in most stores – I buy it on Amazon. I haven’t quilted with a budget brand of thread and therefore can’t recommend any. Aurifil will be $10 well spent but if you can’t afford it, ask your local quilt store for recommendations! Whew – that was a lot of shop talk! If you’re still hanging on, take a couple of days to digest it and shop around if you need a sewing machine. Shoot me your questions or comments – next up will be cutting and pressing (ironing) and then we talk fabric while you gather supplies! Will will add a rotary cutting set and iron to the list tomorrow! Until then – happy browsing! Late Friday night, I finished up binding my Wild Soul quilt in preparation to take it with us to Leadville to see a friend ride in a skijoring competition. Anyway, it was such a fun day! I asked my husband if he wouldn’t mind holding up my quilt for a few pictures in front of the mountains on the way home. The views were stunning – I couldn’t take a quilt named “Wild Soul” into the heart of Colorado and NOT take a landscape photo, right?! Except it’s March in the high country – the first place we stopped we both sank up to our THIGHS in snow! I was laughing too hard to take a decent photo – Ryan wasn’t tall enough to hold the quilt with half of his body buried! The rest of the ride back to the interstate was spent going – “There!! Quick, pull over!! No – there!! Aww, you missed it – there!! Stop stop stop! That looks good! !” But we managed to get some fun pictures, I double checked some math, and without further ado – I’d like to introduce Wild Soul! I hope you love this quilt as much as I do!